This delicious version of a Greek salad uses creamy avocado in place of cheese. It’s the perfect side dish to any summer meal! Pair it with your favorite plant-based protein source or a lean protein for a hearty meal! You can also serve it on top of a bed of greens if desired. 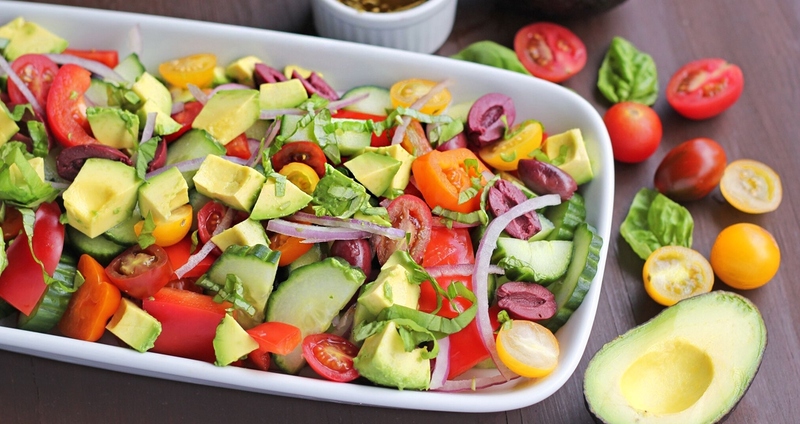 Add the cucumber, cherry tomatoes, bell pepper, onions, olives and avocado together in a large bowl. Mix the ingredients for the dressing in a separate bowl, then pour over vegetables and toss to coat. Serve immediately, or store in the refrigerator until serving.